simulated, optimized and sliced to many PALS by CUPL. Barring one wire wrap error, the board worked right away. 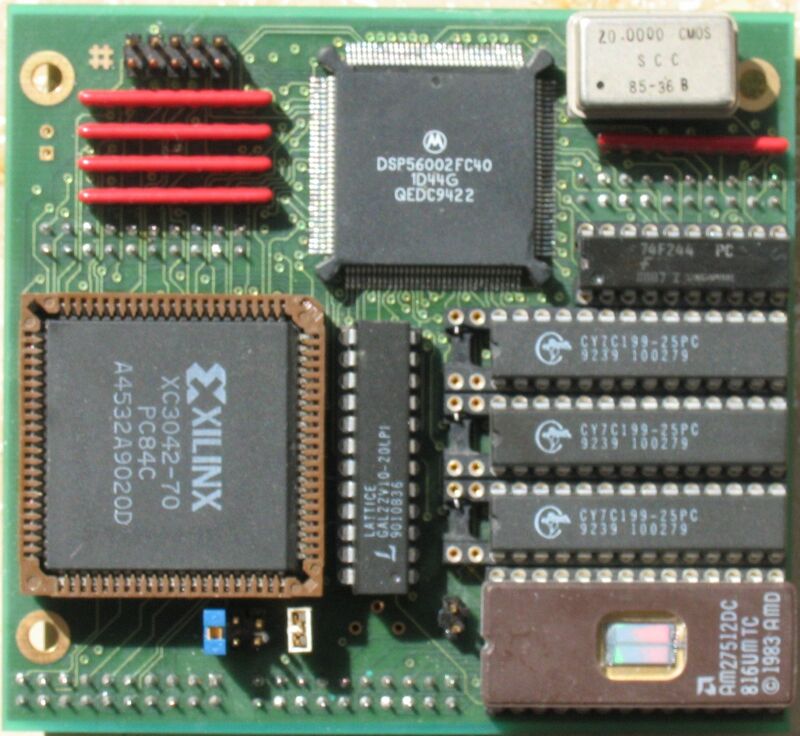 One of the first 80386 computer boards in Multibus II format. 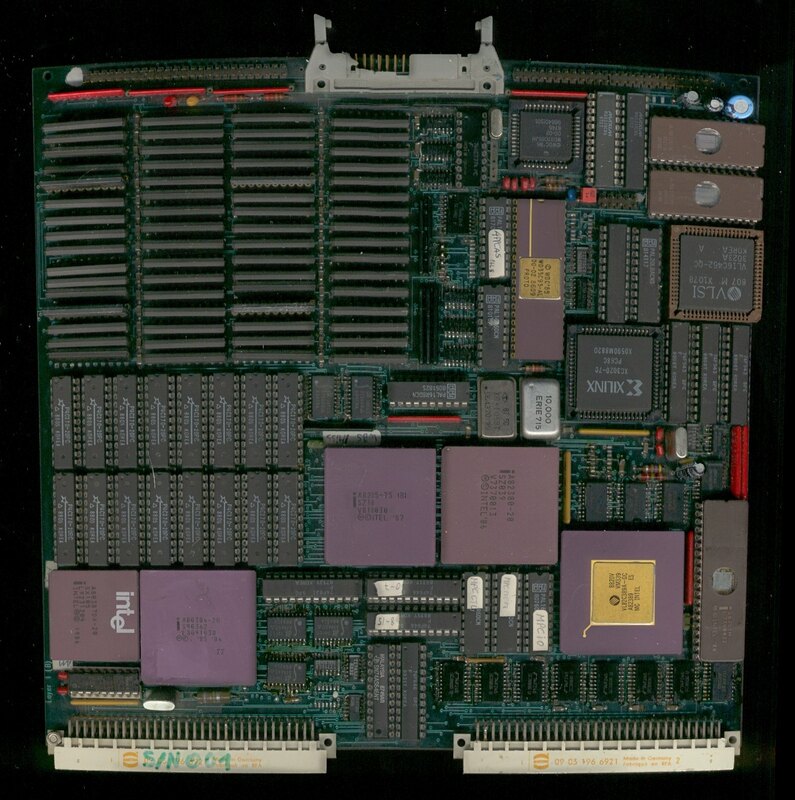 a whopping 8 MB of RAM, com1:, com2:, lpt1:, floppy, SCSI and an Inmos Transputer link. The board has suffered a bit in the meantime. done in real time. The brown board fed the computation units and collected the results. of the blurred part of the picture. 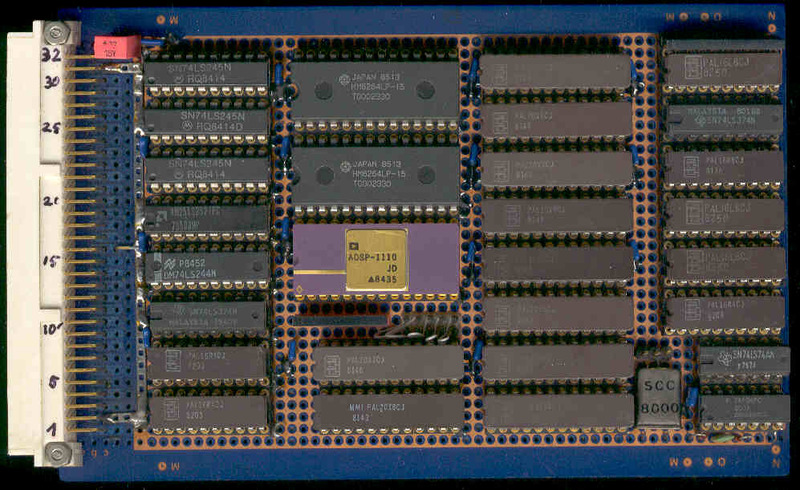 The ADC chip was huge, the reference ladder was visible to the naked eye. We were given an extra chip in a resin cube. The signal averager took two thirds of a 6HU 19" crate. 5 years later I did a redesign in 100K ECL that needed only two computation units for a 8 Bit / 100 MHz real time digitizer. That one was huge and hot. Another 5 years later I condensed everything into a single 100 * 220 mm Eurocard. The pipeline of the computation core was 13 clocks deep. ADC rate was 200 MHz. Those Siemens pipelined demultiplexing ECL to TTL converters were heaven sent. They happened to be like custom made for us. 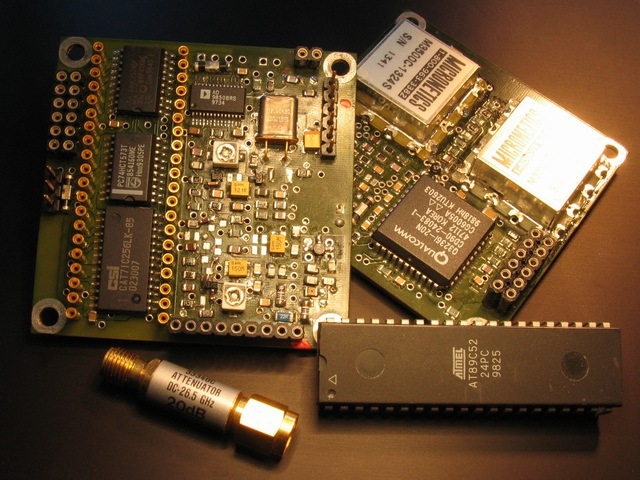 I did the whole project : analog, digital, FPGAs, board layout, soldering and software driver. Two channel logarithmic 2nd IF amplifier, phase comparator and phase / amplitude digitizer for a 1-1000 MHZ Poynting Vector analyzer. This had to be extremely small so that the analyzer probe would not disturb the field to be measured. 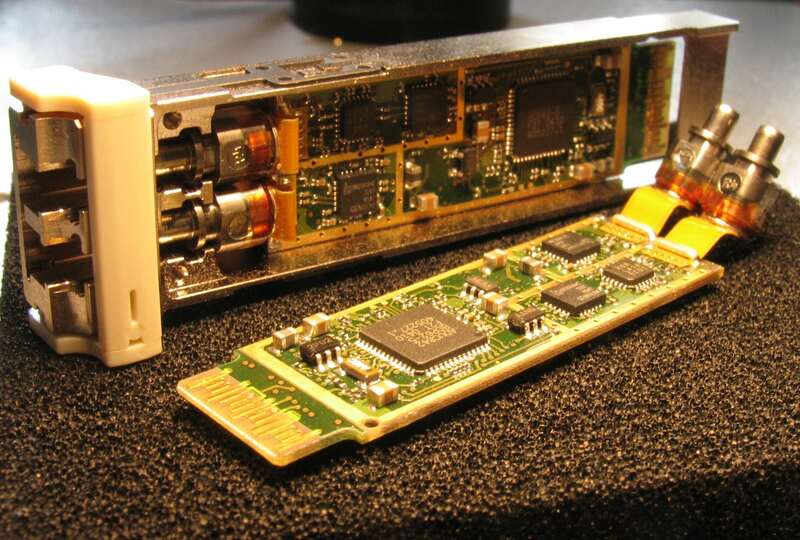 Two bandwidths suitable for EMC measurements are provided. 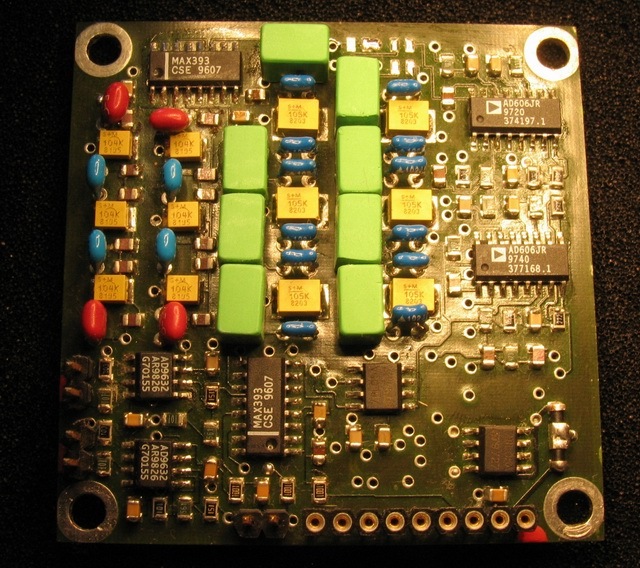 The Phase comparator and ADCs for amplitude 1, amplitude 2 and phase are on the back side. Total gain is > 100 dB but it does not oscillate, even with these "sociable" inductors and shielding removed. Controller, synthesized local oscillator and second oscillator for the same Poynting vector analyzer. The second oscillator multiplies the 120 MHz crystal oscillator to 1080 MHz. The controller runs on a subharmonic of the crystal with accurate baud rates. Two boards, 55 * 55 mm each. I have done the whole project: Concept, design, layout & software. Large Virtex-2E and a Coolrunner for an ultrasonics pipeline pig. 1024 ultrasonic heads distributed across the tube periphery. The bottom side of this board isn't empty, either. 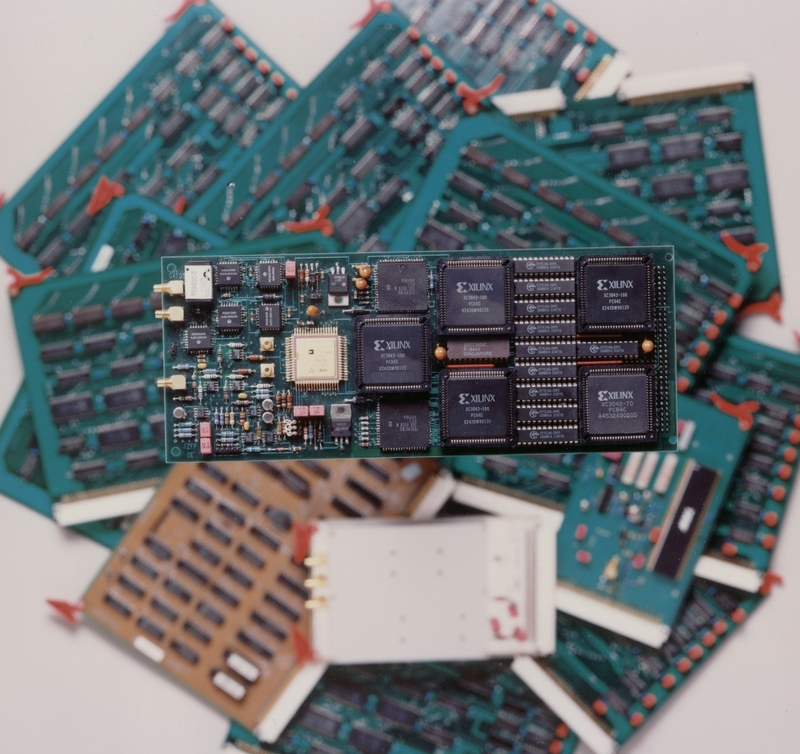 Power dissipation was a great problem because the system contains lots of these boards. that transport the heat to the periphery. It is clamped to the chassis with wedge locks. The chassis is made from machined aluminium and is soldered in a salt bath. Forced air cooling would have required more power for the fans than for the electronics because of mechanical constraints. Board material is Polyimide, because FR4/FR5 would soak hydrocarbon and swell if the enclosure was not absolutely tight. Pipelines are hostile. We got connectors to the outer world from a submarine supplier. 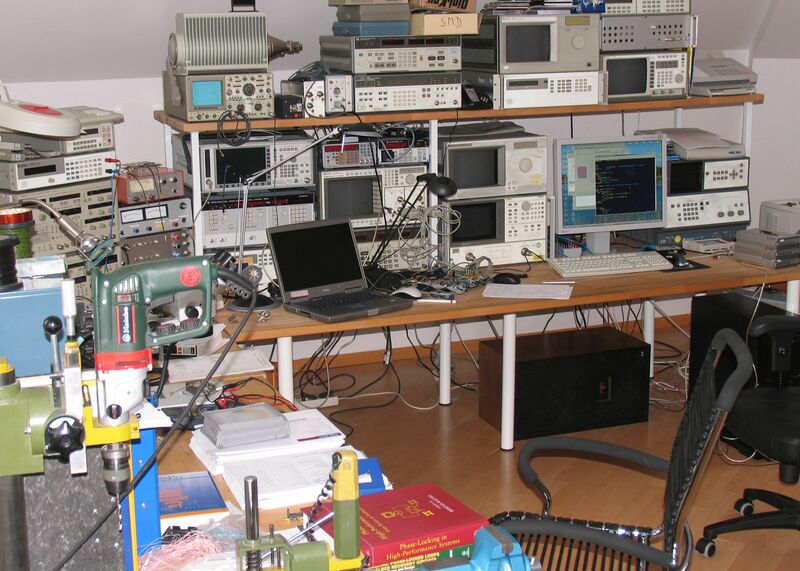 My own lab, from DC to > 20 GHz.